View of Playa Calahonda from the Balcon de Europa. 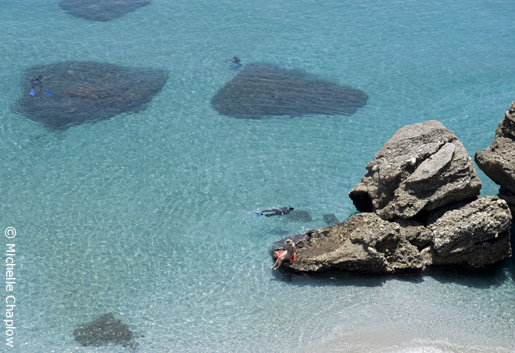 The Beaches of Nerja are one of the towns´s biggest assets, the crystal clear waters and rocky outcrops the pepper the coastline make it a haven for snorkelling and scuba diving. The steep cliffsides offer breath taking views; of course none as spectacular as that of the Balcon de Europa. The shape of the coves mean the waters are tranquil and the beaches protected from harsh winds. Restaurants, kiosks and chiringuitos scattered along the shoreline ensure that the beaches of Nerja are unmissable and well catered; a haven for both tourists and locals. El Playazo beach lies to the West of Nerja town centre, between Urbanización La Tropicana and the mouth of the river Higueron; approximately 1.8km long. it is accessible from the N340 via the Rambla de Chillar. The sand is typically mediterranean; dark with course grains. Facilities include: showers, sunbeds, parasols and number of beach side restaurants located on the paseo, to the East of the beach, on the edge of the town. The excellent facilities and high standard of cleanliness have been recognised by the European Union who awarded it the Blue Flag. Due to it´s size this beach remains relatively quiet even through the summer months, with tourists preferred to stay within the town centre. 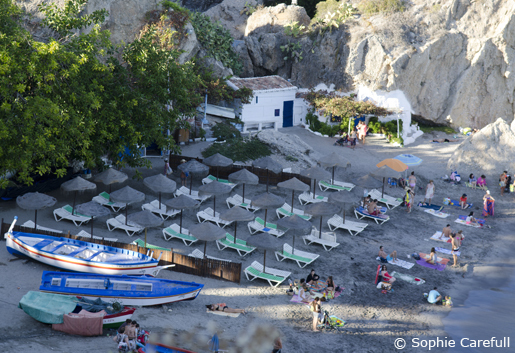 La Torecilla is a small beach on the Western perimeter of Nerja town, at the end of Avenida Castilla. This beach is backed by urbanizations and the Paseo Maritimo which goes part of the way around Nerja´s coast; due to the undulating and rocky terrain the paseo cannot go all the way around the shoreline, to get to El Salon beach you have to walk slightly inland along the road. Facilities include: beachside cafés and kiosks and a few parasols and sunbeds, but the size of this beach makes it difficult to add more facilites. This beach has also been awarded the Blue Flag by the European Union. It is mostly used by neighbouring urbanizations. The beach takes it´s name from the nearby tower La Torrecilla. It is a small tower that was built to protect Nerja from raids by North African pirates. The tower was actuall destroyed by a British ship during the The War of Independence (much like the Balcon de Europa) but has since been restored. El Salon beach is flanked on either side by rocky cliffs, making it a little difficult to access. It is a small beach backed by urbanizations and hotels, as such it does not have many facilities, as it is mostly used by residents of the hotels or accomodation. This is a very small beach which is situated to the West of the Balcon de Europa. In spite of it´s size it actually offers better services than the Salon beach because of it´s central location, it has sun lougers, parasols, cafés, kiosks and parking you can even rent pedalos. It is surrounded by rocky outcrops which make it a very attractive beach, it has crystal blue waters and it's right in the centre of town, close to the tourist office and other main sites. Scuba diving in the shoals around the Balcon de Europa. Playa Caletilla is just below the Balcon de Europa on the west side. There are three very small beaches to the East of the Balcon de Europa, they are all separated by boulders and rocky cliffsides. The beaches are accessible via a footpath which passes along the cliff at the back, it is not an easy walk making it difficult for families with prams or wheelchair users. These beaches are ver picturesque and share beautiful blue waters, protected by the natural coves. 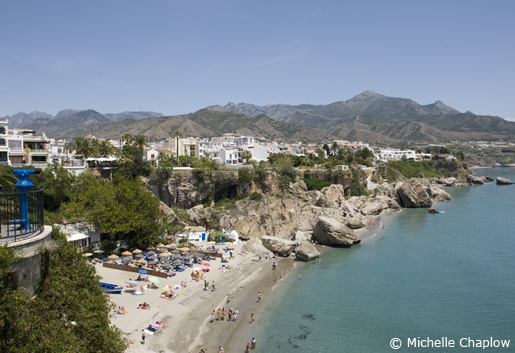 They also have the added advantage of being situated in the centre of Nerja town, visible from The Balcon de Europa. These beaches are particularly popular for snorkellign and scuba diving because of the tranquil waters and clear shoals. There are basic facilities here: restaurants, chiringuitos, sunbeds and parasols for hire. Playa Calahonda just beneath the Balcon de Europa has old fishermen's cottages built into the rock. Playa Burriana is the most famous of Nerja's beaches it is very popular with families because there is a childrens play area and a volley ball net. In spite of how busy it gets it is surprisingly spacious and clean. Like the rest of Nerja it is picturesque, flanked by cliffs on either side backed by some urbanizations but also wooded areas and gardens, as a result of this it retains a rustic feel and has few services. There are pedalos, sun lougers and parasols to hire, also there are some showers and restaurants set back off the beach itself, along the promenade. It is accessible from the N340 via Calle Bajamar, which links the main road directly to the beach car park. 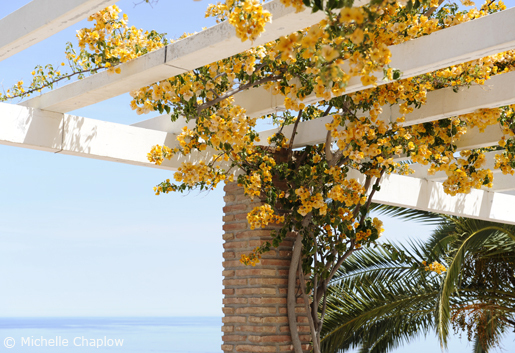 The beach has received many awards, including the Blue Flag and the Spanish equivalent "Q" for quality. 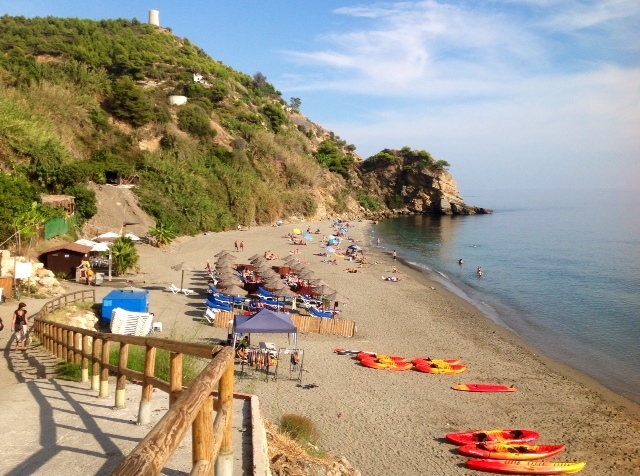 Just east of Nerja is a village called Maro, whose Blue Flag beach is aptly named Playa de Maro, or Caleta de Maro. This secluded cove is widely considered one of the best beaches in Andalucia, and indeed in all of Spain. This Blue Flag beach is widely considered one of the best beaches in Andalucia. Playa de Maro is very beautiful - off-the-beaten-path, backed by cliffs, with turquoise waters, and surrounded by beautiful wild vegetation; it's well worth the effort of getting there, despite the tricky parking plus a short walk (see below). The beach is popular with snorkellers and scuba-divers, due to the clear waters inhabited by an abundance of fish, the sheltered situation, and the rock formations around the headlands either side. It's also a great spot for swimming in the warm Mediterranean currents. Maro beach has showers and public toilets (bring your own loo paper, just to be safe), and sunbeds and sunshades can be hired. The beach has been recognised by the Blue Flag award for its cleanliness and good facilities. The beach also has a kiosk, and a beach bar called Los Acantilados. A family-run chiringuito serves all kinds of delicious meals, from fresh sardines to lubina (sea bream) and langostinas (big prawns). Steaks and chicken are also served along with salads, and the famous egg and chips for veggies. Kayaks can be hired from March to October - the popular one-hour kayak route is heading west, to see the spectacular cliff-face waterfall, and around a small rocky outcrop island to the next cove and beach called Playa de la Caleta. The waterfall is beautiful, with its green moss and interesting rock formations - (spoiler alert!) it's a great surprise when you come upon it, yet it is located only five minutes' kayaking from Maro beach. Playa de la Caleta, which is quieter, can also be reached on foot from the village, but access is complicated weaving between very ugly plastic greenhouses. Playa Maro was voted best beach in Andalucia and number 2 in Spain (a close runner-up to La Granadella in Alicante) in an Antenna 3 poll in July 2013. It has been recognised by the Blue Flag award for its cleanliness and good facilities. Playa Maro is also the starting point of the Maro - Frigiliana Walk which is classified as a medium/difficult activity in GuyHunter Watts´s book, ´Coast to Coast Walk´. 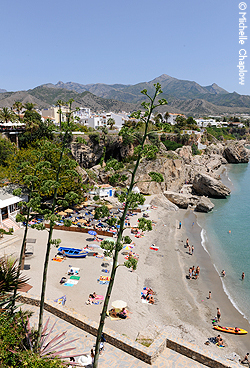 The village of Maro has a blue flag beach, Playa de Maro. The small cove is accessible by car, down a steep and windy tarmac road. There is a very small car park at the end of the road, which soon fills up in the summer, overflowing with cars parked up the steep access road. 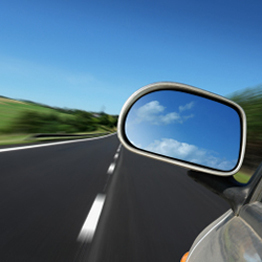 If you are driving down and reach the beginning of a line of parked cars, it's best to leave your car and walk down the rest of the way. A little further east the next beach is part of the Acantilados de Maro-Cerro Gordo Natural Area. 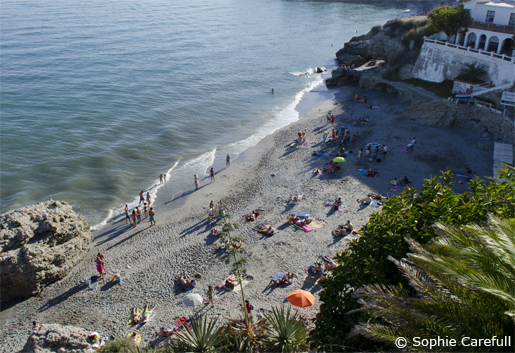 This is a unique stretch of near-virgin coastline which runs for 12km east of Nerja to La Herradura. Its dramatic rocky steep cliffs (acantilados) plunge down to the sea, leaving a few sheltered bays with beaches inbetween. Due to the protected natural area status it is not posible to drive down to track to the beach in motor vehicles. The athletic may walk or cycle. This beach is served in the summer by a shuttle minibus. Park your car just of the N340 at 36.750473N,-3.783031W (map) and wait with the other tourists in the green tin shelter for the minibus. Return ticket is €2 per person, pay the driver. There is a popular beach bars 'Chiringuito La Piedras' where drinks, snacks and full lunch menu is served.